Advances in digital photography and smartphone cameras have turned almost everyone into an amateur photographer. But there’s only so much wall space, and you can take a lot of digital photos in a short amount of time. Digital photo frames give you a fast and easy way to display a large amount of photos. Some digital photo frames can display photos from Facebook, Instagram and Dropbox as well as directly load photos through a dedicated email address. Our ReviewLab team did in-depth research on features like auto-cropping, auto-rotating, multimedia playback, and internal memory capacity to find the frames that offer the best combination of resolution and convenience features. Read more about our methodology. 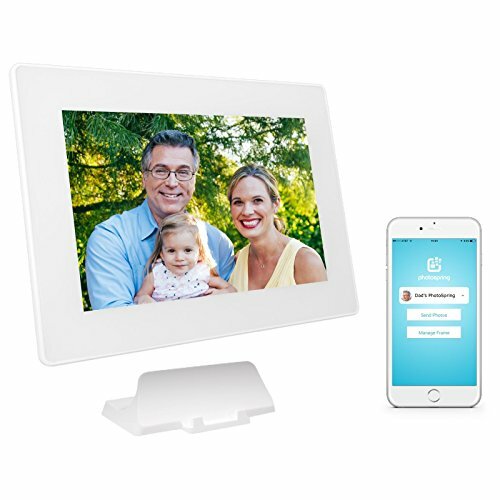 This versatile frame allows you to directly send photos using email or the mobile app. You can also create playlists using photos from Facebook, Instagram, Dropbox, Flickr and Google with Nixplay online storage. This model can also optimize photo sizes for the best viewing and lets you set auto shutoff with the onboard motion sensor. An impressive amount of auto adjust features make this frame a top contender. With 16GB of digital storage capacity, you have plenty of room in your PhotoSpring app to store the photos and videos from your smartphone or digital camera. This simple HD frame can handle photos and videos in the same slide show and provides excellent resolution. It has good external storage options and comes with an easy to use remote control. This widescreen frame displays photos and presentations with good clarity. 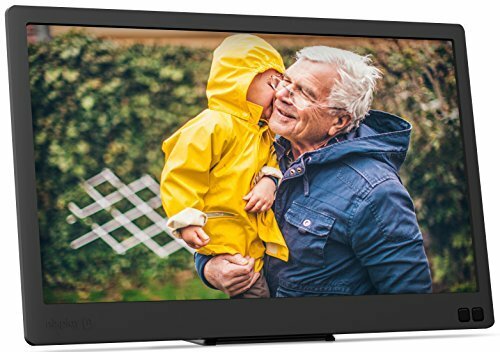 With a choice of transition styles and the ability to playback PowerPoint presentations, this frame offers you good basic viewing options with a few extra features that work well. This frame has a little bit of everything, including auto on/off and a choice of play modes, transitions, display modes and sorting modes. It can also be used to check the weather and play on one of the several preloaded games. A good frame with 2GB of internal memory to store photos for those who want to keep their favorites loaded and ready to go. Programming can be more difficult than other models, but once you get your photos loaded, the pictures are clear and colors are bright. 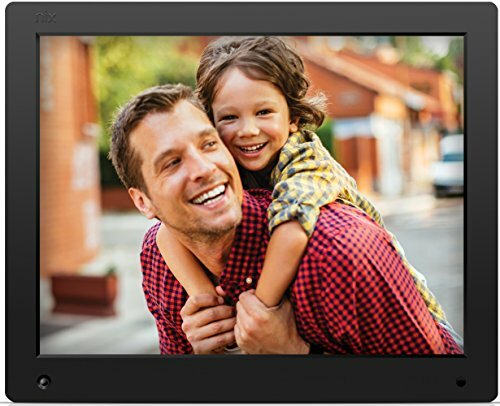 The full HD display on this frame makes for sharp images and videos with vibrant colors. With the Edge, it’s possible to upload photos and videos, create playlists and share them with friends and family. The Advance lets you view photos and watch videos in HD. A motion sensor saves electricity by turning the frame on when you enter the room and off after you leave. It includes a portable memory drive and remote control. While resolution isn’t everything, it’s not something you want to ignore. The lowest resolution you should even consider is 640 x 480 pixels. Anything below that and your photos will be pixelated and grainy. Check the resolution carefully before purchasing because, even within the same frame model, the resolution can change with frame size. Aspect ratio can vary from 4:3, the ratio most often used by point-and-shoot digital cameras, to 16:9 or 15:9. A 16:9 ratio gives a widescreen look and feel to your photo but may cut off parts of the shot to fit the screen. You’ll need to consider the look you want and the aspect ratio of your photos. There are three basic memory options with digital photo frames: internal memory, memory cards and/or online and cloud storage. Internal memory allows you to store photos on the frame itself so you don’t have a memory card sticking out of the frame. Because of the limited size of a digital photo frame, most frames don’t have a lot of internal memory and some have none at all. Most digital frames have SD/SDHC card slots and USB ports that allow you to view photos with external storage. Using this method, there will be a card or cord either sticking out or connecting the frame to a computer. 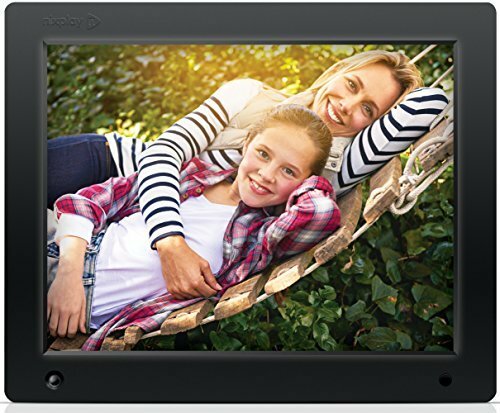 Some digital photo frames offer a free email address and online or cloud storage options through Bluetooth or a Wi-Fi connection. You can email your photos to the address to be automatically displayed on the frame. Cloud storage allows you to organize your photos into playlists, upload videos, or add music. The basic connectivity options include USB, Wi-Fi, and Bluetooth. Wi-Fi lets you download photos from your computer or online storage site to the frame. With the right camera or smart phone, Bluetooth will wirelessly download photos from your camera or phone to the frame. The ideal connectivity option for you depends on your comfort with technology and the devices you already have and use for taking and storing photos. Frames that have both Wi-Fi and Bluetooth allow you to load photos to the frame from anywhere with a Wi-Fi connection. There are a few extra features that can make a big difference for your overall satisfaction. Automatic adjustment of photo orientations makes sure your photos display whether they are landscape or portrait. Other frames can browse the internet, stream internet radio, or display a clock or news feed. The more features you have, the more complicated the setup and menu will be. For around $40 you’ll find a basic seven to eight-inch frame with a USB port and SD/SDHC card slot for external photo storage. Quality and functionality aren’t always great in this price range, but there are a couple of frames that work well if you’re on a budget. Between $50-$100, you’ll find seven to eight-inch frames with resolutions around 1024 x 768 pixels. Some come with remote controls, stereo speakers, clock or calendar. Small frames in this price range provide a good balance between picture quality and extra features. For $100-$150, you’ll see frames of similar quality to the $50-$100 frames but with screens that are ten to fifteen inches. Many frames at this price range also include internal storage as well as ports for external photo storage. You’ll also see more multimedia photo frames with cloud storage options. At over $150 are screens up to 21.5 inches with impressive resolution. They may include internal storage, cloud storage and Wi-Fi connectivity. 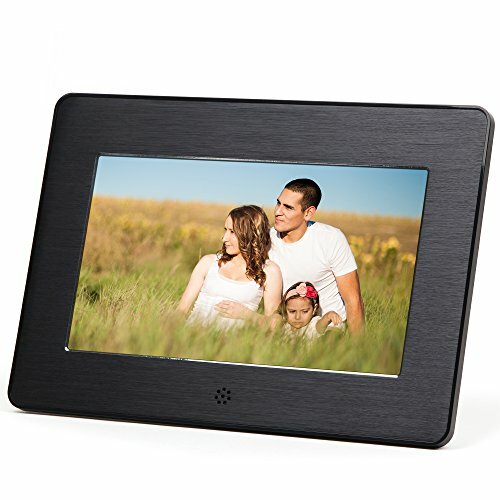 A combination of great features along with excellent resolution make this digital photo frame stand out from the rest. The USB port, SD card slot and Wi-Fi connectivity provide versatile options for photo transfer and storage. If you have more than one Nix frame, you can use your Nix online cloud storage account to send photos and playlists to different frames. It has VESA mounting holes so you can mount it using a VESA-approved TV mount. You can save electricity by setting the motion sensor to turn off the frame after a certain amount of time, and adjust settings with the frame’s remote control from the comfort of your couch. Multiple photo transfer and storage options. With a USB port, SD card slot and Wi-Fi connectivity, all of your transfer and storage options are covered. Most users liked having the ability to display photos off of social media while also having the option to plug in a memory stick. View the same photos and playlists on different frames. If you have more than one Nixplay frame, you can display photos and playlists to any Nix frame linked to your account, including frames at other locations, like your office or at a relative’s house. VESA-compatible mounting options. The frame has VESA mounting holes, allowing you to use a VESA-approved TV mount to hang it on the wall. Auto On/Off coupled with motion sensor. The frame automatically turns on when it senses motion in the room and shuts off after a specified time. Users especially liked the ability to adjust the auto shut off time to meet personal preferences. Remote and onboard controls. Many users like having a remote so they can turn the frame off when they turned off their TV. If you can’t find the remote, there are onboard controls on the back of the frame. Overly complex interface for non-tech savvy users. This frame offers a lot of extra features that makes the interface confusing for users who are not tech savvy. This digital photo frame offers the ability to automatically download photos from your smartphone through the PhotoSpring app. It comes with 16GB of digital storage capacity. You also have the option of sharing your photos with other PhotoSpring frames. It has a good list of auto features, including the ability to automatically adjust photos to fit to the frame and auto sharing of photos from your smartphone. The touchscreen display makes it easy to set up. With a touch of the screen, you can also stop playback of photos and scroll through them at your own speed. Ease of uploading photos. PhotoSpring has a mobile app that makes uploading photos to the frame fast and simple. Many users like being able to send photos from their smartphone directly to the frame using the app. Share photos with other PhotoSpring frames. You can send photos from your PhotoSpring app to any other connected PhotoSpring frame, which gives you instant sharing with family and friends. Automatic features like photo adjustment and sharing. You can set the app to automatically share any photos taken with your smartphone to another PhotoSpring frame. It can also be set to automatically adjust photos to fit the frame for best viewing. Easy to use touchscreen display. The touchscreen makes it easy to set up and intuitive for most users. With a single touch, you can scroll through photos at your own speed. Can only upload photos using Wi-Fi. There is no SD card, USB port, or internal memory. If you’re not comfortable with Wi-Fi or managing photos online, this isn’t the frame for you. Problems uploading. A few users had problems uploading photos. This could a problem associated with older phones or slow Wi-Fi connections. There are few bells and whistles with this frame, but the ones it has work well. You can view multimedia slideshows that have both photos and video. All media must be loaded onto a memory stick or card as that’s the only way to get photos onto the frame. It automatically adjusts photo orientation for the best viewing. The motion detector automatically turns the frame on and off so you save on electricity. Setting up or choosing a slide show is no problem with the easy to use remote control. If you do have problems with this frame, Nix offers excellent customer service that responds promptly and will either walk you through a solution or offer a replacement. View multimedia slideshows using a memory stick or card. You can view photos and videos in the same slideshow using a memory stick or card as an external storage device. Auto adjusts photo orientation. Many users like that this frame automatically recognizes when to rotate photos. You won’t have to eliminate photos from your slideshows based on their orientation. Excellent customer service. Nix offers excellent customer service. Users that needed to convert videos to MP4 files were walked through the process. While others received a new frame if the original frame did not perform as expected. Auto on/off using the motion detector. The motion detector automatically turns the frame on and off depending on the amount of motion in the room. It saves money and electricity as well as prevents the frame wearing out prematurely. Remote control is easy to use. The remote control makes scrolling through pictures and turning the frame on and off simple and easy. Trouble playing animated GIFs. The formatted is supported, but the frame has trouble playing them. A few users had their frame freeze or crash. This inexpensive frame offers basic viewing with a remote control to help you scroll through the settings. There are two playback modes, continuous or random, to give you a little variety. Either works well—just be sure to load photos in the correct orientation before playing them on the frame. The menu is intuitive, making it easy to scroll through and fine tune the settings. You can also use the controls on the back of the frame if needed. It can both play photos and videos but not in the same slideshow. That still gives you some pretty good options in a frame at this price point. Variety of playback with two viewing modes. Photos and presentations can be viewed in either continuous or random mode for variety. Easy to use intuitive menu. The menu is organized for easy use with the remote control or controls on the back of the frame. Displays both photos and videos. It can handle both photos and video but not in the same slideshow. Sluggish response time. When loading photos, the frame is sometimes slow to respond. Degrading screen quality. For a handful of users, the screen slowly degraded over time until blacks looked gray. Digital photo frames with internal memory let you directly store 40-100 photos (some store more) on the frame. They usually have an SD/SDHC card slot and/or USB port for external photo storage. Internal memory works well if you want to preload photos before giving the frame as a gift. You can remove and replace photos from the internal memory at any time. For tech challenged users, internal memory lets you load your photos and start viewing. You don’t need to set up an app, online cloud account, or use an external storage device if you don’t want to. Customizable playback options and an incredible 4GB of internal memory make the Pix-Star a great choice if you want to store photos directly on a digital frame. Getting your photos to the frame can be done through Wi-Fi, USB port, or memory cards. The Pix-Star app lets you transfer photos from social media and online albums like Picasa, Instagram and Facebook. If friends and family own Pix-Star frames or if they download the app, they can share their photos with you. It also automatically resizes and orients photos so you get the best viewing without having to edit. Impressive internal memory capacity. With 4GB of internal memory (that’s nearly 15,000 photos), you can save your favorites directly to the frame so you don’t have to use a memory stick or card if you don’t want to. Many users like being able to preload photos on the frame to give it as a gift. Variety of connectivity and storage options. Along the same lines as memory capacity is the Pix-Star’s ability to connect to Wi-Fi, a computer using the USB port or use SDHC memory cards to transfer photos. Access to pictures on social media and other online platforms. You can view pictures form Facebook, Picasa, Instagram, Flickr and more. Versatile playback options. This frame has amazing playback options including three playback modes, multiple transitions from which to choose, four display modes and four sorting modes. Tech savvy users like the versatility. Photo sharing ability. You can send photos to other Pix-Star frames but friends and family can also send photos to you if they have the Pix-Star mobile app. Users with lots of family like being able to share and connect. Games can only be played with the remote control. The preloaded games can only be played with the remote control, which users report works better as a remote control than it does as a game controller. Setup instructions may be confusing. The included instructions can be tricky to follow but the online support and knowledge base offers great help and tutorials. 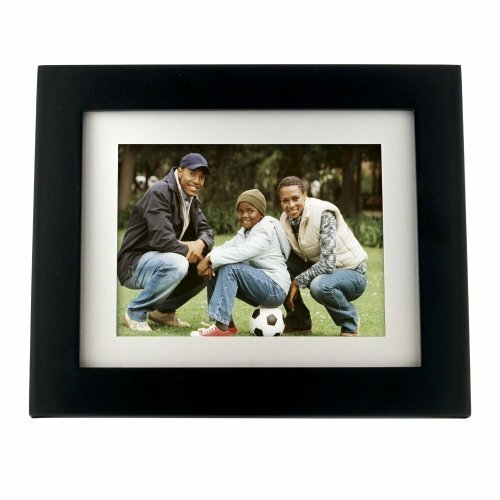 The 2GB of internal memory on this frame make it an ideal way to preload photos and make this frame a gift for grandparents, family and friends. It also has a SD card slot for external photo transfer and storage. The viewing experience with this frame is hard to beat. It has a crystal-clear display with vibrant colors. It also boasts a few extra features that make it worth considering, such as the calendar, analog clock and auto on/off. Good amount of internal memory. Many users like the 2GB of internal memory, especially those who preload it with photos before giving it as a gift. Excellent picture quality. The picture quality of this frame is hard to beat. Users report crisp, clear photos with impressive color. Useful extra features make it more than a picture frame. It also works as a calendar and analog clock. 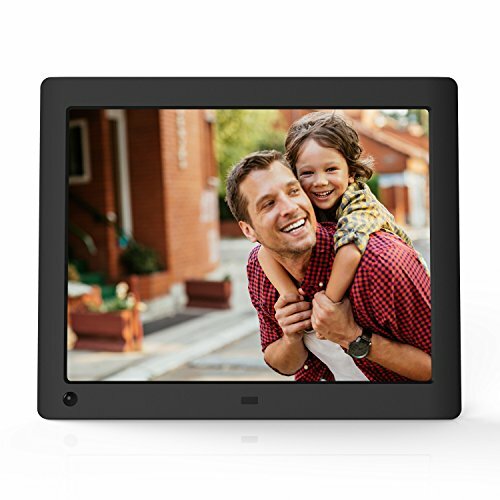 Add to that the auto on/off feature and you’ve got a digital photo frame that is multi-functional and attractive. No support from manufacturer. While the frame performs well, the manufacturer is no longer in business. If you have technical problems, there’s no one to contact but the seller. 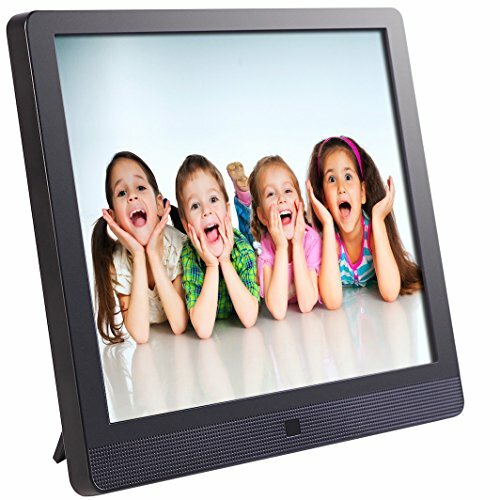 Multimedia digital photo frames offer incredible versatility. They can play photos, music, videos and any combination of the three. Some models can even be used as a monitor to watch streaming videos and view photos from social media sites like Facebook, Picasa, Dropbox and Instagram. Some can directly link to an app on a smartphone for easy downloads. Depending on the model, you may need a USB cord or SD/SDHC card to store and play the video on the frame. Compatible file types vary by model so you’ll need to check compatibility between the file type of your photos and videos with those accepted by the frame before purchasing. A full HD display makes for clear, sharp images and videos with vibrant colors. The quality of the image is one of the top features of the Edge. With a 16:9 aspect ratio, you can easily view wide-angle action videos, and the frame automatically adjusts for photos with a 4:3 aspect ratio. You can watch and listen to videos with HD playback, but videos have to be uploaded through the USB port or SD card slot. If your favorite photos are on social media, you can use the Nixplay app to get the photos to your frame, make a playlist and share with family and friends. Incredible image quality for photos and videos. The image quality on this frame is hard to beat. Many users like that colors match what’s on the camera and that edges are sharp. The 16:9 aspect ratio works well for wide-angle action shots. Access to social media photos. Through the Nix play app, you can download pictures from social media like Facebook, Dropbox and Picasa. The photos can then be sent to your frame or anyone else who also has a Nix frame. Many users like being able to share their photos with family and friends. 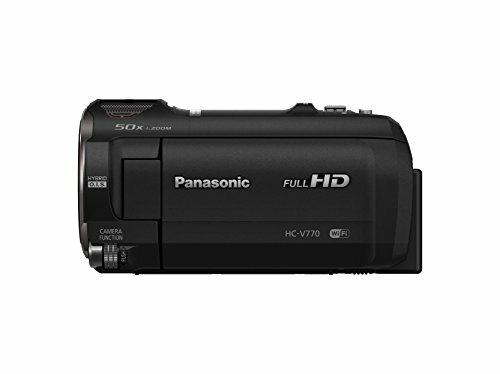 High-quality HD video playback through USB, SD or SDHC card. The quality of the videos is outstanding for a digital photo frame. You’ll have to use an external storage device to upload to the frame, but it’s worth it for the viewing quality. Software glitches can be difficult for tech-challenged users. A few users report problems with the software causing the frame to freeze every few days. Most people were able to troubleshoot the problem, but less tech-savvy users may have problems. This frame works best for those who don’t need or want a frame with access to the Internet. For some, fewer upload options are better. A motion sensor controls the on/off functions, and you can adjust how long the frame stays on after no movement has been detected. Photos are uploaded using the USB port or an SD/SDHC card slot. The frame automatically adjusts the photo orientation so that you don’t have to. The large 15-inch screen makes watching slideshows and videos easier, especially because it still offers excellent resolution. Customizing the turn off time. You can program the frame to shut off after the motion detector has not sensed movement for anywhere between 5-60 minutes. Play photos and videos using the USB port or SD/SDHC card. Plug it in or pop your memory card in the slot and you’ll be watching family videos and photos in no time. Users who are not tech savvy appreciate being able to physically plug the frame in to upload photos. Automatically adjusts photo orientation. You don’t need to worry about landscape or portrait because this frame takes care of it for you. Bigger screen size for viewing slideshows and video. Slideshows and videos are easier to watch on the large 15-inch screen. If you’re planning on using a frame for home videos, this screen size works well and the picture is still crisp and clear. No Wi-Fi. The lack of Wi-Fi is not necessarily a bad thing if you’re looking for a simple frame in an optimum size for watching videos.